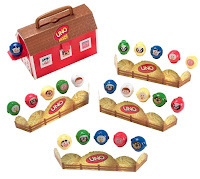 One of the very first games I bought when I started working in the schools was UNO MOO by Mattel. I think a lot of SLPs are unaware of what a great resource this game is for therapy, so I wanted to write a review and share some ideas on how to modify the play to target different goals. Although UNO Moo is advertised as a preschool game, I have to say that even my 5th graders still enjoy it. The game consists of a barn house that is filled with a variety of colorful round plastic animals (dog, chicken, sheep, pig, cow, skunk) and white farmer pieces. Each player starts out with five pieces that are randomly picked from the barn house and put behind the haystack barrier so that the other player can’t see. Another animal is placed in the barn house window. The premise of the game is simple: Be the first one to return all of your animals to the barn. You get rid of your animals by matching either color or animal type to the one that is sitting in the barn window. For example: If the animal in the window is a green dog, you can either play any green animal or a dog of a different color. You can also play a white farmer anytime (compare to a “Wild Card” in the original UNO card game). But beware: Skunks are prowling the premises, as well! If a Player A places a skunk in the window, Player B has to pick two animals from the barn and add them to their pile (compare to a “Draw +2” card in the original UNO card game). Playing the game in its original sense helps kids with their matching skills. Often my students will only focus on the animal’s color, but forget that they can match like animals, as well. You can use the little animals to work on sorting skills: Have the student group animals by color or by animal type. Or have him sort the game pieces into groups so that each group contains at least one animal of each type. Similar to the previous suggestion, you can use the animals to work on following directions of all complexities. For example, “Before you put the green dog on top of the barn, put the yellow chicken next to the blue cow.” Wow-ee if your kiddos can master this, they will ace the Concepts & Following Directions subtest on the CELF-4! This one takes some prep work, but is well worth it. Here is what you will need: Small Avery circular labels of assorted colors and an index card. Place an Avery sticker on the bottom of each animal. Then, place a sticker of each color onto a note card and write the words “Sound,” “Word,” and “Sentence” next to each (if you have more than three colors, you can also add “Phrase” or “Conversation”). Once the setup is complete, give a student a word list with their target sound. Students may then begin playing the game adhering to the original game rules. When it is their turn, they will turn over the animal before placing it in the barn window and check the color of the label. Then they will match the color to the note card instructions and say their target sound either at the sound, word, or sentence level. And the whole time they will think they are playing a game! Speech therapy success! If you have a student working on phonological processes you can use the animals as visual representatives for a sound. For example if you are targeting final consonant deletion and are practicing CVC words, you can put three animals in front of the student (maybe the first two of the same color, the last of a different color) to cue them into the word-final sounds. Similar to the previous suggestion, you can use the animals as visual support when working on manipulating words. For example, when working on phoneme substitution, each color could represent a different sound. Any other ideas about how to use UNO Moo? Please leave a comment! Thanks for the great ideas! I just found this game at a local thrift store and can't wait to start using it in therapy!